Unlike humans and various other creatures (dogs included), cats’ evolutionary process has resulted in no dietary need for carbohydrates. Just like their undomesticated, and much larger relatives, domesticated cats’ bodies have adapted to a protein and fat rich, carbohydrate-poor diet. In the wild, cats use plants, primarily tall and short grass, for digestive regulation and dental support. However, wild cats do not consume vegetable or plant matter for the purpose of energy or nutrition. Cats are unique in their attachment to specific textures of their food and it is difficult to get them to accept/change to other forms of food. For this reason, we recommend that you try to feed kittens a mix of canned and dry with the hope that they will always accept both. At Newport Harbor Animal Hospital, we take pride in providing our patients and their human caretakers with all the information necessary to help cat owners make educated decisions about all facets of feline nutrition, cat foods included. By 5-8 weeks of age, your kitten should be able to chew its own kitten food, and you should provide a protein rich and energy filled diet, with feedings taking place 3-4 times daily. There are many different types of kitten food available, and we would like to discuss these dietary options with you at your next veterinary appointment. Typically we recommend canned kitten food because it will mimic the natural diet both in consistency and formulation. However, a good diet may also consist of a combination of canned and dry kitten foods. After 6 months of age, kittens should be fed 2 times per day. Kitten food is usually very high in protein, calories and fats, which are all necessary to support healthy growth and body function. Feeding the right kitten food in the right amounts, and at the right times throughout the day is essential for happy, growing cats. Our veterinary staff would be happy to discuss the best kitten food options for your feline friend, as well as a proper feeding schedule at your next veterinary appointment. Although dry cat foods are very popular among cat owners, they should be considered the second choice for cat food. This is because dry foods have a higher carbohydrate count than we consider optimal. In addition, the protein choice tends to be higher in plant and not animal based protein. The high levels of carbohydrates and plant protein can lead to weight gain and digestive issues, especially in older and more sedentary cats. However, dry food is convenient and the best choice for busy households. Some premium food brands have developed formulas of speciality, prescription formula dry cat foods which can be sound choices for cats with allergies, certain health conditions, and as part of a diet also containing canned or fresh food. Wet cat foods can have a nutrient profile that mimics the kind of diet cats would choose in the wild. The protein in canned cat food is usually animal based, which means that canned cat food has a nutritional profile that compliments a cat’s evolutionary profile and physiological needs. Canned cat food also usually has a low carbohydrate count, and a high water amount. Fresh cat foods are the same kind of foods a cat would consume in the wild. 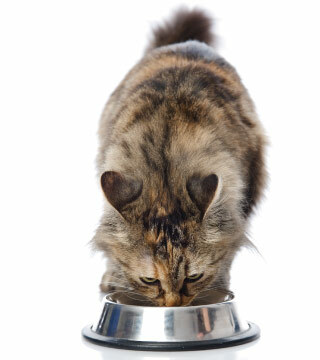 Fresh cat food diets are high in unprocessed proteins, fats, vitamins, minerals and of course, water. They are also very low in carbohydrates. Unfortunately, it can be very difficult to get your cat to accept a change in food types and texture. If your cat is doing well on his current diet, then there may be no need to change to a different formula. Some brands make a Senior cat food which is specially formulated to deliver ingredients which are more easily digested than standard adult cat foods. Senior cats are more likely to develop health issues related to intestines and kidney disease. There are diets specifically formulated to benefit cats with these issues which may help slow the progression of these diseases. Your veterinarian can help you choose the best cat food for your senior cat by taking pre-existing medical conditions, current health status and overall lifestyle (indoor, outdoor, sedentary, active, etc.) into account. Cats also have evolved to receive the majority of the water in their diets through the consumption of food. This is why sound feline nutrition includes a diet that is rich in unprocessed proteins and water. Canned cat foods are usually formulated with water content in mind, and can contain up to 80% of this feline nutrition requirement per serving. Proteins all have their own digestibility profile, because some proteins, like fish and chicken, are more available for use in the body than other proteins, like plant and dairy. Digestibility refers to the net amount of protein that is left after the cat food’s chemical breakdown in the body. Proteins also contain essential amino acids that synthesize, or break down and utilize, the protein molecules themselves. Amino acids are synthesized in the liver with the help of carbon and nitrogen. There are 30 total amino acids, 20 dispensable (or non-essential) and 10 non-dispensable (or essential). Dispensable refers to the ability to be safely absent from a diet. This means the 10 non-dispensable, or essential amino acids, must come from a cat’s diet. A high quality cat food that follows a sound feline nutrition requirement protocol will only use unprocessed or minimally processed fish, poultry and meat that contain upwards of 40% of this feline nutrition requirements per serving. Essential fatty acids: Essential Fatty Acids, also known simply as fats, provide the most concentrated source of energy of any feline nutrition requirement. In cats, fats provide energy, making carbohydrates unnecessary. Fats carry fat soluble vitamins: D, E, A and K.
A high quality cat food will contain between 20-40% fat (essential fatty acids) of total daily calorie intake. Fat soluble vitamins are processed and can be stored in fat cells. They are generally more sustained release than water soluble vitamins, and also have acute toxicity levels. Water soluble vitamins must dissolve in water before the body can use them. They cannot be stored and therefore must be replenished with greater frequency than fat soluble vitamins. A raw or minimally processed cat food diet usually fulfills vitamin requirements naturally through the use of whole foods like chicken, meat and fish. Dry foods usually add synthetic vitamins to make up for the removal of natural ones during processing. Although there is no universally accepted vitamin intake requirement for cats, exhaustive documentation exists to support vitamin intake as part of overall feline nutritional health and wellness. The overall balance of a cat’s diet is affected not only by the levels of each individual minerals, but also by the interactions between them. For this reason, we recommend consulting a veterinarian or veterinary nutritionist about mineral amounts and balance when choosing cat food, or cat food supplementation. Make an appointment today and let one of our veterinarians help you make the right nutritional choices for your cat.